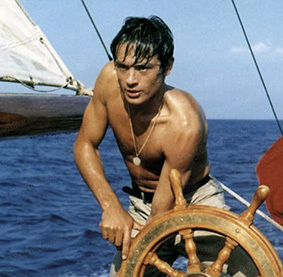 Studiocanal and the ICO have announced that in celebration of the centenary of director René Clément, a beautiful new 4K restoration of Plein Soleil (1960), starring Alain Delon, will be released in UK cinemas on 30th August 2013. This new 4k restoration has been produced by Studiocanal in association with the Cinémathèque Française, and with the Franco-American Cultural Fund’s support. L’Immagine Ritrovata, a laboratory in Bologna, handled the restoration work. The restoration premiered in Cannes this May. Plein Soleil is a striking study of a glamorous and complex psychopath from Oscar-winning French director René Clément (Forbidden Games, Is Paris Burning? ), featuring a career-defining turn from a young, beautiful, ultra-cool Alain Delon, The film was the first adaptation of Patricia Highsmith’s best-selling novel The Talented Mr. Ripley. Dennis Hopper and Matt Damon have also both appeared as Tom Ripley on screen (in films by Wim Wenders and Anthony Minghella respectively), but arguably neither match up to the ice-cold portrayal by a then 24 year-old Delon, in the role that made him a star. Highsmith, who also wrote Strangers on a Train, was herself very pleased with the film and called it "very beautiful to the eye and interesting for the intellect." Another Highsmith adaptation, Two Faces of January, opens later this year. Henri Decaë (The 400 Blows, Lift to the Scaffold, Bob le Flambeur, Les bonnes femmes) was responsible for the glorious sun-drenched cinematography in Plein Soleil, restored here to all its former glory, alongside a wonderfully unsettling score composed by Nino Rota (The Godfather, The Godfather: Part II, La Dolce Vita, The Leopard). Described as the French Hitchcock, René Clément was one of France’s great post-World War II era directors. Studying as an architect originally, it was at the Ecole-des-Beaux-Arts that he developed an interest in filmmaking. In 1936 he directed his first film – a short written by and starring Jacques Tati. Clément then spent most of the latter part of the 1930s making documentaries. After the war he directed his first feature: La Bataille du rail (1945), about the French resistance, which was a critical and commercial success. He twice won Oscars for Best Foreign Language Film – including Forbidden Games, along with many other awards throughout his career. Following its cinema run, Plein Soleil will be released on DVD and for the first time on blu-ray in the UK, on 16th September 2012. More details will follow nearer to the release date.